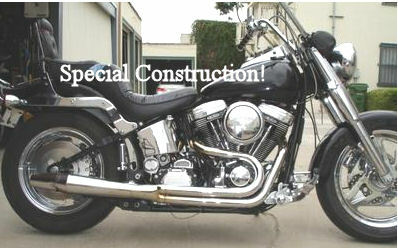 This special construction 2006 Harley Davidson demonstrates exactly what makes Harley Davidson special and then some with only 8000 miles on it! This custom built motorcycle has a 100 inch motor, a 6 speed transmission, custom wheels and crazy cool sounding Thunderheader exhaust..reviews don't touch the auditory experience of these pipes. I would be willing to consider trading this beauty for; I don't know..what do you have? If you would like to write a review or voice any opinions on the custom built Harley Davidson motorcycle for sale, you may use the comments form below this ad to do so. Thanks for visiting GoGoCycles Used Motorcycles for Sale and for taking a look at my Special Construction 2006 Harley Davidson. In my opinion there's not a nicer motorcycle for trade on Craigslist in Los Angeles California CA or in an Ebay auction especially for the cheap price of only $7500 (or a trade?)! If you want to take a look or have questions, call me, stan, (NO EMAILS) 32three 87four 57six5 for more details and don't forget to mention that you found this ad on Strike Lightning's Used Motorcycles and Parts for Sale www.gogocycles.com.